Send us an email at hello@entrythingy.com - we'll get back to you really quick. What's the best way to find out how this works? Watch the videos here. They'll show you how it works. Please contact us at at hello@entrythingy.com if you have any questions. Where does EntryThingy and my data live? EntryThingy runs in the 'cloud'. That's a fairly new term and doesn't really mean anything to most people. But it's sort of fun to say. So. EntryThingy runs on Amazon Web Services (AWS). The server and database run on EC2 instances. Those are basically Linux machines that can be easily started up when needed and stopped when not needed. The big advantage for us is that the cost is relatively low, and we have the flexibility to add servers or move up to bigger and faster machines when the need arises. Your data is stored in two different areas. We use a MySQL database in a master/slave configuration. This is where all data except files are stored. This means that there are 2 copies of all metadata on two different computers at all times. Files are stored in Simple Storage Service (S3) buckets. We use these services to give you access to the same highly scalable, reliable, fast, inexpensive data storage infrastructure that Amazon uses to run its own global network of web sites. All data (except image files) is stored in a MySQL database and mirrored through a master/slave setup to another database on a different computer. The Slave MySQL data is stored in an AWS EBS volume. The EBS volume is automatically replicated within the same Availability Zone. This prevents data loss due to failure of any single hardware component. This means that there are two copies of all data (except image files) on two different machines (and replicated!) at all times. All data (including image files) is backed up nightly to S3 buckets in a data center on the west coast. So while the servers and data are in a data center on the east coast, the backups are on the west coast. So even if the east coast gets sucked into the ocean (which we really really hope won't happen) , we can start everything right back up on the west coast. So how about that! And: We keep full daily copies of all data for one month. Image file backups are stored in a separate S3 bucket - files are not deleted nor does the EntryThingy system have read or delete access to the backup bucket. This is what Amazon says about the reliability of S3: "Amazon S3 gives any developer access to the same highly scalable, reliable, fast, inexpensive data storage infrastructure that Amazon uses to run its own global network of web sites. The service was designed for 99.99% availability..." - and "Amazon S3 uses proven cryptographic methods to authenticate users." How do I put an EntryThingy on my site? Watch the short Installation video here. It'll show you how it works. Please contact us if you have any questions. Where is my EntryThingy on the entrythingy.com web site? The URL of your EntryThingy on this website is https://www.entrythingy.com/d=YOURDOMAIN - replace YOURDOMAIN with the domain you used when you signed up on the Get Your EntryThingy page. You can always use the form on the Get Your EntryThingy page to get the HTML code for your site and get the link to your EntryThingy on the entrythingy.com website. I don't want to put it on my site. Can you host my EntryThingy for me? Fill out the form here - but instead of grabbing the code, bookmark and click the link to your EntryThingy hosted at entrythingy.com (a little further down on the page). You can link to that page on your site and do everything there. Contact us and we'll host your EntryThingy for you with your site's design. By the way - if it's just a matter of you not quite knowing how to put it on your site - no problem - contact us and we'll work with you to put your EntryThingy on your site. EntryThingy should have a minimum of 650px horizontally or it'll look weird and squished. Please make sure you give it at least that much horizontal space. Please contact us if you have any questions. I don't see a login form on my site, it just says Loading... with a twirly thing. This happens when the EntryThingy code somehow gets messed up by something. That 'something' can be a whole slew of things. Like when you're using an online site builder tool. They sometimes translate stuff into other stuff that in turn breaks things. So if you see Loading... with the twirly thing instead of your form, please contact us by email. We'll figure it out! It keeps jumping to the top of the page. What can I do? How do I change the text that shows to the right of the entrant registration form? I want to show a list of my shows instead of the entrant registration form. I want to show the login form instead of the entrant registration form. I have several calls but want to show only certain calls in my EntryThingy. Click into the calls you do not want to show, then [settings],  and set the call status to "Do not show to entrants or jury". replacing THEIDS with the IDs of the calls separated with commas - you'll see the ID to the right of "#show=" in the location bar of your browser when you're in the call as admin. Please let us know if you need help determining the ID of your call. How do I get it to work in Wordpress? You'll have to add a plugin that lets you use raw HTML. The Raw HTML plugin is here. How do I make it skip the main page with list of calls for entries when there's only one call? and it will go directly to the instructions for entry after the entrant finishes their registration. First of all, take a look at the default css here: http://entrythingy.s3.amazonaws.com/resources/entrythingy_widget1.css. You'll see classes from et_logininput through .et_editentryinput - change those to style the respective elements. There's also et_savebutton through et_cancelbutton - use those to style the buttons. There are some more classes that start with pt... those are used to add margins to UI elements - maybe you want to play around with those as well. ptp, for example is used to style <p>s. Please contact us if you have any questions on any of this! What's a token, what do they cost and how do I get them? Each entry that you recieve costs one token. The price for one token is $2. To purchase tokens, login to your EntryThingy as admnistrator, click 'admin' and 'purchase tokens' to purchase your tokens through Paypal with your Paypal account or major credit card. You can also purchase tokens directly from us - plase contact us for more information. an artist clicks the Submit button and finalizes their entry. This is when the status of an entry changes from 'not submitted' to 'submitted'. an administrator changes the status of an entry from 'not submitted' to any other status. This is also the case when you use the 'update status' macro on a show. What about bogus or unwanted entries? You can delete bogus or unwanted entries to receive a refund of one token per entry. To receive the token refund, the entry's status must be set to 'submitted'	- click the delete link for that entry to delete the entry and automatically receive your one token refund. You will not receive a refund if the entry's status is set to anything other 'submitted' when you delete an entry. We trust that you will use this feature in good faith. We reserve the right to cancel your account if we detect any misuse this feature. How do I know if I still have enough tokens? You can always login to your EntryThingy as an administrator, click into the Admin area and click [purchase tokens] to see how many tokens you have left. In addition, all administrators receive alert emails when your token count reaches 50, 20, 10 and 3 tokens. Tokens do not expire, so they'll carry over to your next call(s). There's a 10% service charge on token refunds - just email us at hello@entrythingy.com and let us know if you want your refund through Paypal or check. Show me how to set up a call for entries in a video! How do I preview my call before it goes live? Set the status of your call to "Show to entrants and jury" but keep it hidden from the call list by turning off the option "Publish to call list" directly above the status dropdown. Then logout, go to the signup page and register as an entrant with a dummy email and go through the entry process to make sure it's working the way you want. You can also stay logged in as admin, open your EntryThingy page in a different browser (eg Firefox if you're logged in as admin in Chrome) and register as an entrant there. I want to collect more information from my entrants. When entrants sign up, they are asked for basic contact information after they've registered. If you want to collect any other type of data, we can help you by adding any type and number of input fields to the right side of the form. Please contact us for more information! How do I integrate payment options such as Paypal? You can use Paypal or any other payment gateway to receive your entry fee payments. Since most use Paypal, we'll show you how you add a Paypal payment button to your call. Please contact us if you'd like to use a different payment gateway or, as always, if you have any questions at all on this. When entrants click the 'Submit this Entry' button for their entry, whatever you enter in the call settings field 'Default Instructions for Entrants After Entry is Submitted' is displayed. You can add any text instructions for submitting payments (such as an address for sending checks) and the html code for a Paypal button that'll take the entrant to your Paypal payment page. Use the form below to generate the html code for your Paypal button and copy and paste it into the call settings field 'Default Instructions for Entrants After Entry is Submitted'. You can replace the "Submit this Entry' button with a Paypal payment button that automatically sets the status of the entry to 'Submitted' when the entrant pays the fee through Paypal. Use the form below to generate the html code for your Paypal button, make sure you select the option "I'm replacing the 'SUBMIT THIS ENTRY' button with this Paypal button" and copy and paste the html code into the call settings field "Replace 'SUBMIT THIS ENTRY' button with:". Note: If you're using this option, please add some text above the Paypal button code that tells the entrants that they have to click the Paypal button to pay their entry fee and submit their entry. Fill out the form below to generate your Paypal button html code. The button will automatically add the call name to the Paypal item name and the entry number to the item number so you'll know which payments belong to which entries. It will calculate the price based on the selections you make below for each entrant. I'm replacing the 'SUBMIT THIS ENTRY' button with this Paypal button Note: If you're using this option, please add some text above the Paypal button code that tells the entrants that they have to click the Paypal button to pay their entry fee and submit their entry. Entrants don't see a call for entries listed after they register. Make sure you've set the call for entries status correctly. It can be either 'Do not show to entrants or jury', 'Show to entrants and jury' or 'Show to jury only'. How do I ask for booth/display images? Select the 'Ask for art or booth/display' in the call settings (Click into the call, click [settings] and  - it on the right side) Entrants will not be able to submit their entry unless they've selected the booth/display for one upload. The booth/display upload will automatically be pushed to the bottom of the images. The booth/display image will not show up immediately in both the offline and online juror views. There's a link for each entry that must be clicked to display the booth slide. You can allow artists to add up to 3 views in addition to the main image. Watch this video to see how it works. What information can I ask for in entries? How do I ask entrants for their artist statement and resume? To enable this, login as admin, click into a call for entries, click [settings] and then . Scroll down and select 'Ask for statement and resume', scroll down a little more and select 'Show link to entrant profile' - then click 'Save'. Now, when an entrant adds their entry, there will be a new page shown when they start their entry where they will be asked to paste their statement and resume. They can also add and edit both in their profile by clicking 'My Profile' and . With the 'Show link to entrant profile' enabled for a call for entries, jurors will see a link to the entrant's profile that they can click and view the statement and resume. How can I set minimum and maximum upload/image sizes? How can I determine which file types may be uploaded? Deadline for Entries: Entrants can submit entries up to the deadline for entries date - the call is shut down at midnight depending on the time zone of the entrant. Deadline for Late Entries: When you define a deadline for late entries and it's after the deadline for entries but before the deadline for late entries, entrants will be shown a message alerting them to the fact that they're submitting a late entry and that they should check the entry instructions for more information on what that means. At midnight on the deadline for late entries date (again depending on the entrant's time zone) the call is closed for entrants. The EntryThingy call listing page lists all current calls hosted through EntryThingy. We see hunderds of visitors to this page every day - you will reach a lot of artists just by using EntryThingy! There's also a cool interactive map of all current calls. Entry confirmation emails include a list of suggested calls with links that take them to the EntryThingy page on each organization's web site. The list is based on which other calls other entrants applied to that also applied to the call. The list is then sorted by relevance. Art-Linx.com is pleased to offer art and craft festivals nationwide the most economical and effective Call to Artists program in the industry. The Art-Linx.com Call to Artists offers unparalleled exposure to thousands of qualified art festival exhibitors throughout the United States. Click here for more information on the Art-Linx.com Call To Artists. 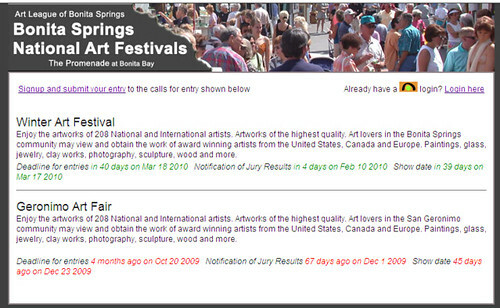 CallsforArtists.com is the #1 ranked site on Google for the search term "art fairs" - it's a great place to advertise your art show to attract more customers! Click here for call listings on CallsforArtists.com. Click here for call listings on Artshow.com. How do I add entries received by mail? Login as an admin, click into a show and click [add entry]. Fill in the first and last name of the entrant (and email if you have it) - or just fill in part of the first and last name. Click the 'Find & Add »' button and you'll get a list of already existing entrants that match what you entered. Select an entrant from the list or click a link to create a new entrant. When creating a new entrant, you only have to enter a first and last name. If you want the entrant to be able to login and view their entry, enter their email address, create a password for them and send them an email with that information. After you've selected or created an entrant, the process is the same as the entry process for entrants. How do the entry list and pieces wall filters work? Categories: This is only available if you've defined categories in the Show Details. Select a category from the dropdown to filter the list on that category. Select 'All Categories' to turn the filter off. Status: Select a status from the dropdown to filter the list on that status. Select 'All Statuses' to turn the filter off. Text field: Type a name or part of a name to filter the entries on entrant names. You can also enter entry numbers to find the entry with that number. Just type, it'll automatically filter. Clear the field to turn this filter off. What are the entry statuses for? Not submitted: Before an entrant clicks the 'Submit this entry' button. They may not have uploaded all of their images yet. No token has been subtracted from your token account. Submitted: The entrant clicked the 'Submit this entry' button and can see the 'Instructions for Entrants After Entry is Submitted'. One token has been subtracted from your token account. If you set the status back to 'Not submitted', you will be credited one token. You may want to do this if an entrant needs to change their entry. Show to jury: Only entries set to this status will be visible to jurors. This applies to the online and offline jury views. Accepted: The entry has been accepted for the show. Use [update status] to automatically set this status based on juror points. Only entries with this status will show in the accepted entries thumbnail widget (click [download] -> [widgets] from the entries list). Not accepted: The entry has not been accepted for the show. Waitlisted: The entry is on the waitlist. Withdrawn/Refund: The entry has been withdrawn and a refund was sent. Withdrawn/No Ref. : The entry has been withdrawn and a refund was not sent. What do I do if an entrant has submitted their entry but needs to make changes? Set the entry's status back to 'Not submitted'. You will be credited one token. Let the entrant know that they can login again using their email and password, click into the show and make any necessary changes and then click the 'Submit this entry' button again. One token will then be subtracted again from your token account. What do I do if I've received a payment for an entry but it hasn't been submitted by the entrant? Set the entry's status to 'Submitted'. One token will be subtracted from your token account. How do I send emails to the entrants based on their entry status? Login as administrator, click into the Admin area and then click [emailer]. Watch the video here to see how it all works. How do I delete a call for entries? Login as administrator, click into the call you want to delete, click [settings] and then [delete this call]. How do I change the category of an entry? Login as administrator, click into the call, click into the [entries] list, find the entry and click the category name - you'll get a popup asking you whether you want to change the category, then you'll be able to select from your categories. Is there an API with which I can change entry statuses? c= the organization's site code, it's the same as the sitecode in the EntryThingy code on your site. apikey= We'll generate one for you and associate it with your account. ppin= Replace the 1st x with the call ID, the second x with the entry number. How do I send email alerts to my entrants? Watch the video here, it'll show you how it all works. How do I download all of my call data to my computer? Click [download] in the entries list and then [download all]. This will create a ZIP file with all of your call's data and images. After you've downloaded the zip file, extract the data to a folder on your computer (using Winzip, for example). Then find the file starthere.html and double click it to open it in your browser. You will then be able to click into the different views. Do I have to download everything every time? No. After your first download, you'll see a new link [download all since _date_]. The data will automatically be set to the last time you downloaded. Click the link to only download files that have changed or added since your last download. Extract the new ZIP file on top of your original download files to update your copy on your computer. How often should I download? This depends on how quickly your entries arrive. Once a week is probably a good idea. What's the CSV file for? CSV stands for 'Comma Separated Values'. You can import this file into Access or Excel, for example. Make sure you set the delimiter to tab. Although CSV stands for 'Comma Separated Values', we decided to use tab as the delimiter. When importing into Excel or other programs, make sure you select tab as the delimiter - and deselect comma. When you grab the code for your EntryThingy, you create a login that you then use to login to your EntryThingy on your site. You are the first user with administrator permission. To add users that can then become members of your items, click the Admin link at the top and then click the + add user link near the bottom. Admin: Add and edit calls, view entries and set their status. View entrant profiles. Add admin and juror logins. Purchase tokens. Download all call data. Juror: Vote for entries in the calls the juror has been assigned to. Entrant: Add entries in active calls. How do I add jurors to a call? Go to admin/users. Click the +add user link and fill out the form to add a juror. Make sure you've selected the 'juror' permission. Click 'Save'. To add the juror to a call, click into the call from the main view, click [settings], then , scroll down to the Jury Settings area on the right and select the juror(s) you want to have access to the call. Click 'Save' to save your changes. What if the juror's email is already being used for an entrant or admin account? Invent an email, eg juror@yourdomain.com. Jurors don't receive emails from the system so it doesn't matter. Jurors don't see a call for entries after they login. You must assign juror logins to calls for entries so that they will see them when they login. Select the jurors for a call from the 'Jurors' list when editing a call. Also make sure you've set the call for entries status correctly. It can be either 'Do not show to entrants or jury', 'Show to entrants and jury' or 'Show to jury only'. Jurors don't see any entries after they click into a call. Jurors will only see entries with status "Show to Jury". Click into the call as admin and use the drop-downs to the left of each entry to set the entry status to "Show to Jury". What's the difference between voting per entry and voting per piece? voting per entry: each entry consists of multiple uploads/piecess. Jurors vote for the whole entry, ie for all the pieces in an entry. voting per piece: each entry consists of multiple uploads/pieces. Jurors vote for the each piece in each entry. Use the [pieces] link in the Entries list to see a listing per piece ranked by juror's votes per piece. Can I use the online and offline jury presentations simultaneously? Yes. They'll both display in the same order. Display the offline jury presentation with a projector and have each juror login to EntryThingy with a laptop to vote for the entries. I want jurors to see artist statement and resume. Multiple Voting Rounds - how does that work? Please click over to this blog post. What's this gallery widget thing? The gallery widget is the easiest way for you to display a thumbnail image gallery of your accepted entrants on a page on your web site. Just copy and paste some html code to a page on your site and there it is! Learn more about the image gallery widget on the video tour page - click the 'Image gallery' link on the right. Where do I get the code for my image gallery widget? Make sure you're logged into your EntryThingy as an administrator, click into the call, then [downloads] and then [gallery widget]. There are a whole bunch of options that you can use to customize your widget - just select your options, the code updates automatically. When you're ready, click the text field with the code, then copy and paste the code to a page on your site. This is probably because you asked for permission to use images for publicity and the entrants selected no. You can change that by finding the entry in the entries list and click on the word "no publicity" - then it'll let you change that to "publicity ok" and then the images should show in the gallery. Where's that video that'll show me how the entry processs works? If you are experiencing stalling, or failing uploads, please follow the steps below to improve your chances of success. If your upload completes and your JPG image does not display properly, please make sure you have set the color space to RGB / sRGB. The most reliable way to upload to EntryThingy is by using a browser equipped with the most up-to-date technology. Please make sure you have the newest version of your browser installed on your computer. Slow Internet connection: Check your Internet connection. One of the main reasons why uploads take a long time is because your Internet connection is too slow or unstable. Heavy uploads traffic: You might be uploading during a busy time. At some peak hours, your Internet Service Provider registers spikes of upload traffic and might take longer to upload your files. You should use a Chrome incognito window or Firefox Private Browse. This will temporarily exclude the use of browser extensions, which may interfere with communication between your computer and EntryThingy. Ad blocking extensions, for instance, are commonly responsible for these problems. You should temporarily disable anti-spyware, anti-virus, or similar software. These programs are also known to interfere with communication. You may also benefit from plugging your computer directly into your modem with an ethernet cable, rather than connecting wirelessly through a router. This can improve the stability of your connection. If you continue to experience issues with your upload, contact us and we may be able to help. It's telling me my image is too small or too large. Please contact the organization hosting the call and ask them about the image requirements and what they recommend you do. I have to edit my entry after it has been submitted. Please contact the organization hosting the call and ask them to set your entry back to "Not submitted". You will then be able to edit your entry. I'm lost. Where do I submit my entry? EntryThingy lives on each art organization's web site. You'll find a link to their EntryThingy there. You'll also find links to EntryThingys in the Current Calls list here. What's the status of my entry? Please click over to the Artwork Management page where you can login with your EntryThingy email and password and view the status of all of your entries submitted through EntryThingy. If the status is not available, it's because the call is in jury. Please contact the organization hosting the call if you have any questions on this. I have a question about the entry instructions, image requirements or other issues relating to a call. Please contact the organization hosting the call. You'll find links to the organization's web site in the Current Calls list here. I have a question about entry fee payments. What's the difference between [reuse previous] and [select from my artwork]? Click [reuse previous] to reuse images that you've previously added to other calls for entries. Not all of your previous images will be available as organizations delete old calls and that also deletes your old entries. Click [select from my artwork] to use artwork from your EntryThingy Artwork Management account. You must upload images to your Artwork Management first before you can use them for entries. You can login to EntryThingy's Artwork Management tool here. I've added images to my Artwork Management account - how do I get them into a call for artists? If you've added images to EntryThingy's Artwork Management, you can now go to the orgazation's web site that's hosting the call for artists. Login to the EntryThingy there, go through the entry process and when you get to the page where you add (upload) pieces, click [select from my artwork] and you can choose which images you want to use for the call from the images you've added to your Artwork Management account. If you don't know where to go for a call, you'll find links to the organization's web site in the Current Calls list here. How do I change my email, password and other profile information? Please click over to EntryThingy's Artwork Management, login with your current email and password, click "My Profile", then [edit profile]. Click [change password] to change your password. If you are already logged in to an EntryThingy on an organization's web site you can also click "My Profile" there to edit your profile and change your password. Important note on emails: Each EntryThingy account must have its own unique email address. You won't be able to change the email if the new email is already being used with a different account. How do I cancel my Artwork Management subscription? Please go here for details on how to unubscribe. If you have a question, contact us at hello@entrythingy.com. We'll get back to you really quick.